Ramen can make an easy, delicious soup when you’re running late, but if you skip the water and add some cabbage and leftover chicken, you can turn that boring soup into a dinner the whole family will love. Growing up, ramen was an easy soup I could prepare myself if either my parents were running late from work or I wasn’t in the mood to make a big meal after a day of classes. It was never an amazing meal, but it did the trick. These days, I’m still a big ramen fan, but not in soup form. I love ramen for their noodles. They’re so easy to prepare and you can add them to just about anything. One of my favorite ways to use them is by stir-frying them up in the wok with a bunch of vegetables and either chicken or steak. While stir-frying is already easy to do, I make it even easier on myself by using pre-chopped vegetables and leftover chicken. That way you still get the same great filling meal in about half the time. And when the clock’s ticking, a recipe that can be made and on the table in 15 or 20 minutes gets a huge check mark in the win column. Bring a large pot of water to a boil over medium-high heat. Add the ramen noodles without the flavor packet and cook for two to three minutes. Drain, toss with one tablespoon of sesame oil and set aside. 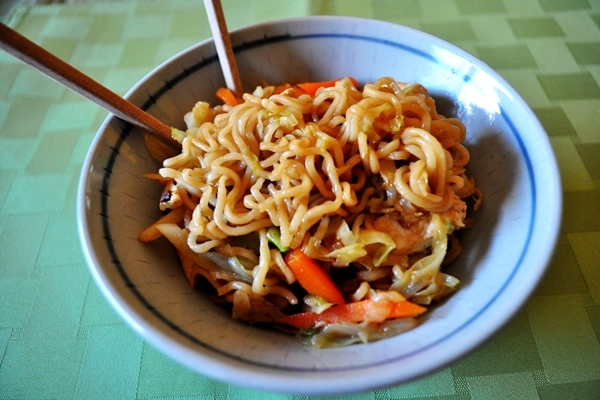 While the noodles cook, heat the remaining sesame oil in a large wok over medium-high heat. Add the garlic and ginger and cook for one minute. Add the cole slaw mixture and the carrots and cook until tender, about three minutes. Meanwhile whisk together the soy sauce, oyster sauce and mirin in a small bowl. When the cabbage is ready, add the chicken and noodles and cook until heated through, about one to two minutes. Add the soy sauce mixture and toss to coat. Serve immediately.